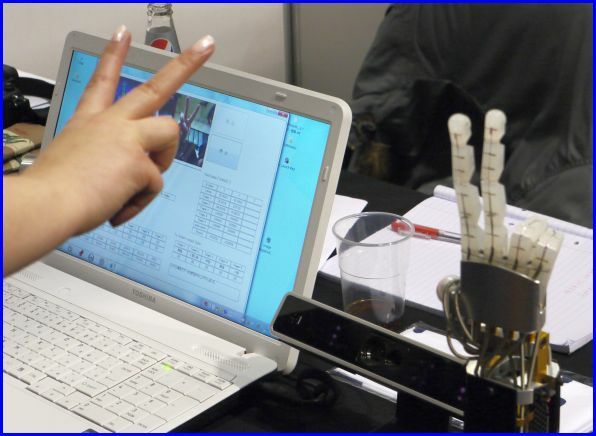 What makes this HANDROID different from other robotic hands, is that it can move all five fingers and lift small objects like a human hand. And it looks amazing! HANDROID is remotely operable, lightweight, durable and has a fluid motion. After the show visitors were given the opportunity to try it out, and of course I wanted to give it a go. There are two ways of operating the robot hand; one being by glove controller and other just by positioning your hand directly above a motion detector, like that used for XBox. I have tried the latter one.